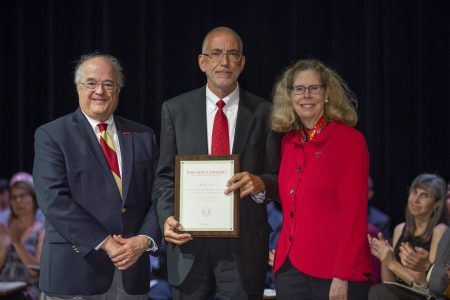 CIRAS Director Ron Cox was one 15 College of Engineering faculty and staff who received Iowa State University’s highest honors during an annual awards ceremony on September 14. Cox, who started as a CIRAS field agent in 1997 and has served as CIRAS director since 2001, received Iowa State’s Award for Achievement in Economic Development in Iowa. The award is reserved for campus employees who either started businesses that employed Iowa residents or who provided “specific documented support to Iowa companies” and thereby benefited those firms.